Geodetic marks are highly accurate reference points established on the surface of the earth by local, state, and national agencies. Maintenance and preservation of these marks is of utmost importance to users of the net and to NOAA’s National Geodetic Survey (NGS), recognizing that many valuable geodetic marks are destroyed by construction, new roads, erosion, or for other causes. Our job is to locate each of these marks and report their condition together with any change in the directions needed to locate them. There are basically two types of marks, horizontal reference and vertical reference. Although the advances in GPS technology have made the horizontal reference marks less of a necessity in surveying, GPS cannot measure elevations accuracy so the vertical reference marks are still necessary for accurate surveying. 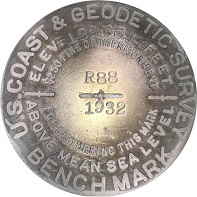 Normally, geodetic marks are round bronze disc, roughly 3 inches in diameter, firmly embedded in concrete, bedrock or on a long rod driven into the ground. The objective of this cooperative charting geodetic mark recovery program is to locate and identify these marks and to report on their condition as Good, Poor, Not Found, or Destroyed. This is a valuable public service and, at the same time an opportunity for Squadron members to get together for a fun off the water activity. Get in touch with our Cooperative Charting experts and get out there!